Kawasaki, Y., et al. Increased Expression of CD44v9, A Cancer Stem Cell Marker, in Head And Neck Squamous Cell Carcinoma Cells after Irradiation. (2017) Int J Cancer Oncol 4(2): 1-5. © 2017 Kawasaki, Y. This is an Open access article distributed under the terms of Creative Commons Attribution 4.0 International License. Cancer stem cells are one of the most promising targets for cancer treatment. In head and neck cancer, CD44 has been regarded as a cancer stem cell marker. However, apart from the standard CD44 (CD44s), many other variants of CD44 exist, and their specific roles are still unknown. Radiation resistance is a known characteristic of cancer stem cells. Therefore, we irradiated five head and neck squamous cell carcinoma cell lines and investigated whether the expression patterns of CD44 variants changed. Common results showed that the number of CD44s-positive cells decreased and that of CD44 variant 9 (CD44v9)-positive cells increased. This suggested that CD44v9 is useful as a marker for cancer stem cells and may be a target for therapy. CD44 is a widely distributed transmembrane glycoprotein expressed in different kinds of cells including lymphocytes, leukocytes, erythrocytes, epithelial cells, and fibroblasts[1-3] and functions as a cell adhesion molecule. Among its known ligands are hyaluronic acid, collagen, fibronectin, and others. CD44 usually has a molecular weight of 80 – 95 kDa; however, its many splicing variants that have higher molecular weights are also known. In humans, CD44 is located on the short arm (p13) of chromosome 11. Its gene sequence encodes the extracellular (exons 1 – 5 and 16), transmembrane (exon 17), and cytoplasmic (exons 18 – 20) domains. These domains make up the protein structure of CD44 standard (CD44s). Variant isoforms of CD44 (CD44v) are generated by the alternative splicing of 10 variant exons (v1–v10) positioned between exons 5 and 16. Therefore, various isoforms can be found in CD44v, and they contain similar regions and variable functional domains[5,6]. CD44s and CD44v are members of the CD44 family, and recently, the relationship of this family with the progression and metastasis of malignant tumors has come under scrutiny. The relationship between CD44 and various malignant tumors such as colorectal[7,8], pulmonary[9-11], and gastric cancers[12,13] is being elucidated. In the field of head and neck cancer, an association of CD44 with prognosis has been reported[7-14]. Regardless of the type of cancer, there have been many reports revealing that CD44 positivity tends to be involved in metastasis and poor prognosis[15-18]. In particular, CD44v6 has come under intense scrutiny, and the expression of CD44v6 is associated with increased tumor progression and metastatic potential. A report demonstrated that CD44v3 is present at higher levels in head and neck cancers than in normal tissues; another report demonstrated that there is no difference between the expression of CD44s and CD44v6 and that the precise role of CD44 is not yet known. Furthermore, CD44 has been suggested to be a cancer stem cell marker in head and neck cancer. A cancer stem cell is an undifferentiated clonal cell. It is pluripotent and has the ability to self-renew; it differentiates according to the environment, has metastatic potential, and is resistant to anticancer drugs and radiation. Doubts have been raised about whether CD44 alone is suitable as a cancer stem cell marker; however, we believe that it is possible for one of the variants of CD44 to be used as a marker. Therefore, we irradiated five head and neck squamous cell carcinoma cell lines and established a resistant cell line. This approach should allow the natural enrichment of cancer stem cells. We then examined changes in the expression of CD44s, CD44v3, CD44v6, and CD44v9 and investigated CD44 variants that showed increased or decreased expression. Human squamous cell carcinoma cell lines HO-1-u-1, Sa3, HSC2, HSC3, and HSC4 were purchased from RIKEN BRC (Ibaraki, Japan). For monolayer culture, cells were maintained in RPMI 1640 medium (Nissui Pharmaceutical, Tokyo, Japan) supplemented with 10% FBS (Clontech Laboratories, Mountain View, CA, USA), 2 mM L-glutamine, 2.4 g/l NaHCO3, 100 U/ml penicillin, and 100 μg/ml streptomycin (Sigma-Aldrich, St. Louis, MO, USA). The medium was replaced every other day. Under each culture condition, the cells were incubated at 37°C in a humidified atmosphere containing 5% CO2 in air. Cells were sown in a 75 mm³ flask (Nunc, Roskilde, Denmark) and irradiated with 2 Gy (CP-160, Japan) every day after becoming subconfluent. Irradiation was continued to a total of 60 Gy. Then, the generated radio-resistant cells were maintained as mentioned above. 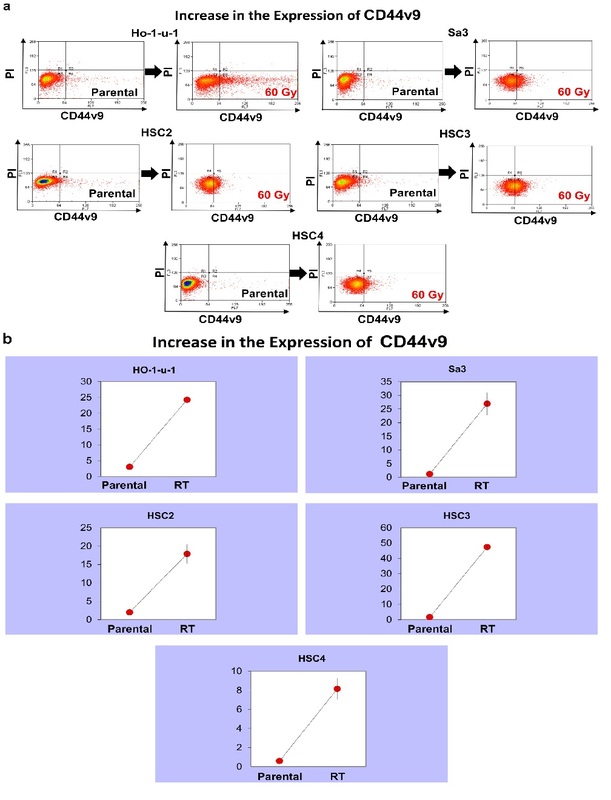 For CD44s, CD44v3, CD44v6, and CD44v9 analyses, trypsinized cell pellets were incubated with FITC-conjugated anti-human CD44s clone SFF-2 (eBioscience, San Diego, CA, USA), APC-conjugated anti-human CD44v3 clone 3G5 (R&D Systems, Inc., Minneapolis, MN, USA), APC-conjugated anti-human CD44v6 clone 2F10 (R&D Systems, Inc.), and APC-conjugated anti-human CD44v9 clone RV3 (Cosmo Bio Co., Ltd., Tokyo, Japan) at a dilution of 1:11 at 4°C for 30 min. After washing with PBS, cells were resuspended in 2 μg/ml PI, filtered through a 40-μm cell strainer and applied to a MoFlo Cell Sorter (Beckman Coulter, Fullerton, CA, USA). To determine the negative fraction, FITC-conjugated anti-mouse IgG1 K isotype antibody (eBioscience, San Diego, CA, USA), APC-conjugated anti-mouse IgG1 isotype antibody (R&D Systems, Inc.), APC-conjugated anti-mouse IgG2B isotype antibody (R&D Systems, Inc.), and APC-conjugated anti-rat IgG2a antibody (Abcam, Tokyo, Japan) were excited with an argon or a helium–neon laser. To avoid adhesion and subsequent maturation, cells were cultured in a serum-free semisolid medium. A total of 1 × 10³ cells were seeded in 80 μl of serum-free RPMI1640 medium, the recipe of which was mentioned above, containing 0.33% agar on 100 μl of a solidified serum-free RPMI1640 basal layer and 0.5% agar in the wells of a 96-well plate. Fifty microliters of serum-free RPMI1640 was poured on the top of each well, and this top liquid layer was replaced every 3 days. The cells were incubated for 20 days under the same conditions as those for the monolayer culture. The number of formed spheres was counted. Student’s t-test was performed for the estimation of statistical significance. p values are two-tailed. All experiments were independently repeated three times. The number of CD44s-positive cells was examined in the five cell lines after irradiation. There were differences in the number of CD44s-positive cells between the cell lines examined, but all cell lines showed a decrease in CD44s-positive cells after irradiation. It decreased from 3.35% to 0.81% in HO- 1-u-1, from 48.5% to 0.17% in Sa3, from 75.4% to 55.7% in HSC2, from 19.1% to 5.1% in HSC3, and from 0.99% to 0.11% in HSC4 (Figure 1). Figure 1: CD44s expression. Five cell lines were subjected to FACS to analyze CD44s. a) The left and right panels show pre-irradiation and post-irradiation data, respectively. Data for HO-1-u-1, Sa3, HSC2, HSC3, and HSC4 are shown. b) The graphs show the number of CD44s-positive cells. CD44v3 expression increased in HSC2 from 2.73% to 21.5%. In Sa3, it increased from 0.11% to 1.12%. In HSC4, it increased from 0.76% to 3.83%. In contrast, in HSC3, it decreased from 5.09% to 1.1%. In HO-1-u-1, it decreased from 1.50% to 1.07%, which was not a significant change (Figure 2). Figure 2: CD44v3 expression. Five cell lines were subjected to FACS to analyze CD44v3. a) The left and right panels show pre-irradiation and post-irradiation data, respectively. b) The graphs show the number of CD44v3-positive cells. CD44v6 expression increased in HSC2 from 2.80% to 24.3%. In HSC3, it decreased from 3.16% to 1.03%. In other cell lines, CD44v6 was scarcely expressed, but expression showed a slight increase (Figure 3). Figure 3: CD44v6 expression. 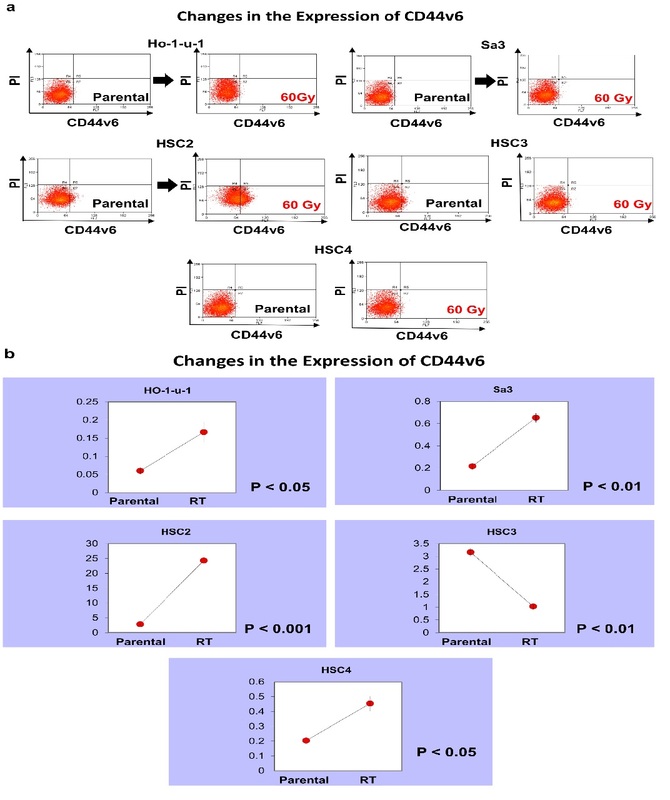 Five cell lines were subjected to FACS to analyze CD44v6. a) The left and right panels show pre-irradiation and post-irradiation data, respectively. b) The graphs show the number of CD44v6-positive cells. Figure 4: CD44v9 expression. Five cell lines were subjected to FACS to analyze CD44v9. a) The left and right panels show pre-irradiation and post-irradiation data, respectively. b) The graphs show the number of CD44v9-positive cells. HO-1-u-1, Sa3, HSC2, HSC3, and HSC4 were able to form a large-size colony after irradiation (Figure 5a). Further, they formed significantly more colonies after irradiation (p < 0.01) (Figure 5b). Figure 5: Cancer stem cell sphere formation in serum-free semisolid medium. A total of 1 × 10³ cells were seeded in a serum-free semisolid medium. After 20-day incubation, the number of developed cancer stem cell spheres was recorded. (a) A representative result. (b) The number of developed cancer stem cell spheres per well in five independent experiments. Error bars represented the SD (n = 5); p < 0.01. After irradiation, the number of CD44v9 increased, whereas that of CD44s decreased. In addition, the number of CD44v3 and CD44v6 increased in some cell lines, whereas decreased in other cell lines. After irradiation, the colony-forming ability was enhanced, and the number of cancer stem cell-like cells appeared to have increased. These results indicated that irradiation induced changes in CD44 variants, among which CD44v9 was suggested to be a cancer stem cell marker. CD44 was originally reported as an adhesion molecule expressed in lymphocytes. Recently, there have been many reports on the association of CD44 expression with metastasis[23,24]. Free cancer cells may circulate in the body via blood vessels and lymphatic vessels using the same mechanism as leukocytes. CD44 functions as a receptor for molecules such as hyaluronic acid, and it has become clear that it can also bind to actin filaments via the ERM protein family. These functions have now been considered to contribute to cancer invasion and metastasis. The expression of CD44s is closely related to metastasis and factors contributing to poor prognosis. On the other hand, decreased expression of CD44s may be a poor prognostic factor due to its association with substantial infiltration into blood vessels and lymph vessels[27,28]. At present, no consensus has been established regarding the effects of CD44v6. Patients with high CD44v6 expression are reportedly prone to metastasis; therefore, it appears to be a poor prognostic factor[30,31]. However, it has been demonstrated that the expression of CD44v6 is attenuated or disappears. A report has shown that the higher the expression of CD44v3, the better the prognosis for survival; conversely, the lower the expression of CD44v3, the worse the prognosis[33-34]. Although CD44v3 seems to be related to infiltration and resistance to apoptosis, future research on it is essential for clearly understanding its function. At present, the importance of CD44v9 is being studies. CD44v9 is expressed in cancer stem cells and functions to enhance the oxidative stress avoidance mechanism that causes resistance to treatment. This indicates that oxidative stress decreases in cancer cells where CD44v9 is expressed. Although some degree of oxidative stress is important for the survival and proliferation of tumor cells, such stress has dual effects of inducing not only differentiation but also cell death when a certain threshold value is exceeded. In addition, in cell membranes, CD44v9 binds to xCT, which is a light-chain subunit of system xc−, a transporter that takes cystine [amaterial of glutathione (GSH)] into cells. The binding by which the CD98 heavy chain becomes a chaperone molecule promotes the formation of reduced GSH, which is an antioxidant, by increasing the stability of xCT at the cell membrane. GSH functions as a scavenger of reactive oxygen species in cancer stem cells, thereby enhancing the resistance of such cells to oxidative stress. A tumor was originally thought to be a homogeneous population of cells, but it is, in fact, a heterogeneous aggregate of populations. More than 20 years have passed since cancer stem cells were identified. It was originally claimed that cancer stem cells are enriched in the SP cell group, but some non-SP groups also have tumorigenic potential. It was also claimed that CD133 is an absolute marker of glioblastoma, but tumor formation is also possible in CD133− cells. Thus, it is impossible to identify cancer stem cells with a single marker alone; this is also true for CD44 in head and neck cancer.Our experiment showed that cancer stem cells were able to form a number of colonies after irradiation even in the three-dimensional culture system (Figure 5). The increased colony-forming ability in the serum-free semisolid medium indicates the proliferation of cancer stem cells. In this study, we irradiated cell lines to utilize the properties of cancer stem cells in an attempt to investigate the variants of CD44. The finding we observed was that the expression of CD44s decreased and that the expression of CD44v9 increased upon irradiation (Table 1). Considering that cancer stem cells were enriched by irradiation, it can be said that CD44v9 is one of the stem cell markers for cancer. In addition, the decrease in the expression of CD44s is consistent with a report stating that cancer expressing a lower level of CD44s is more malignant. A report has also demonstrated that CD44v9 plays an important role as a cancer stem cell. Against this background, further analyses of CD44v9 are essential. Table 1: Fluctuations in the expression of CD44 in various cell lines. CD44s showed decreased expression, while CD44v9 showed increased expression. We irradiated cell lines and examined variants of CD44. 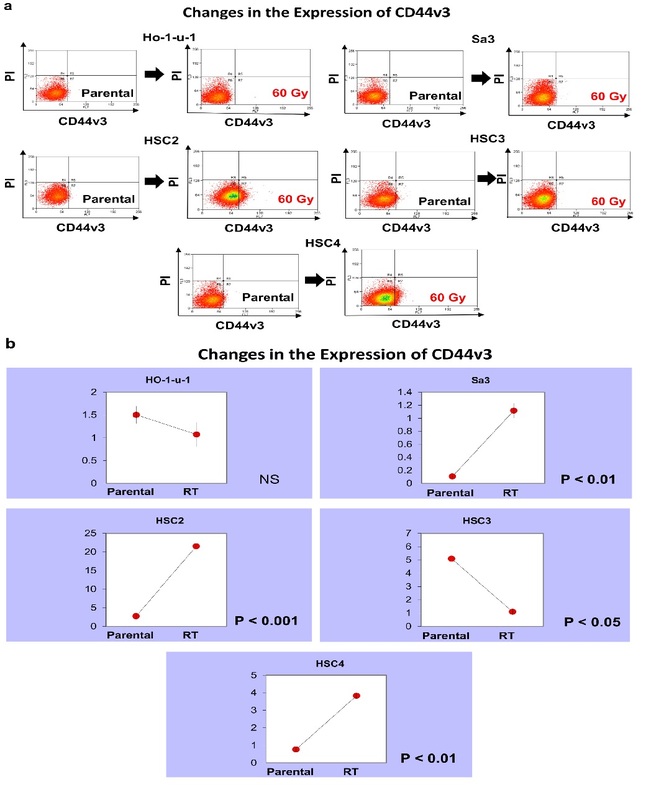 In all cell lines, CD44s expression decreased and CD44v9 expression increased. On the other hand, expression of CD44v3 and CD44v6 were scattering by cell line. Given the importance of CD44v9 and the suggestion that it is one of the cancer stem cell markers, it requires further investigations. Cancer stem cells can be eradicated by establishing a therapy that targets CD44v9, which may lead to the suppression of recurrence and metastasis. 1. Jalkanen, S., Bargatze, R.F., de los Toyos, J., et al. Lymphocyte recognition of high endothelium: antibodies to distinct epitopes of an 85-95-kD glycoprotein antigen differentially inhibit lymphocyte binding to lymph node, mucosal, or synovial endothelial cells. (1987) J Cell Biol 105(2): 983-990. 2. Aruffo, A., Stamenkovic, I., Melnick, M., et al. CD44 is the principal cell surface receptor for hyaluronate. (1990) Cell 61(7): 1303-1313. 3. Arch, R., Wirth, K., Hofmann, M., et al. Participation in normal immune responses of a metastasis-inducing splice variant of CD44. (1992) Science 257(5070): 682-686. 4. Forsberg, U.H., Jalkanen, S., Schröder, J. Assignment of the human lymphocyte homing receptor gene to the short arm of chromosome 11. (1989) Immunogenetics 29(6): 405-407. 5. Screaton, G.R., Bell, M.V., Jackson, D.G., et al. Genomic structure of DNA encoding the lymphocyte homing receptor CD44 reveals atleast 12 alternatively spliced exon. (1992) Proc Natl Acad Sci USA 89(24): 12160-12164. 6. Stamenkovic, I., Aruffo, A., Amiot, M., et al. The hematopoietic and epithelial forms of CD44 are distinct polypeptides with different adhesion potentials for hyaluronate bearing cell. (1991) EMBO J 10(2): 343-348. 7. Indinnimeo, M., Cicchini, C., Giarnieri, E., et al. Evaluation of CD44 variant 6 expression and clinicopathological factors in pulmonary metastases form colon carcinoma. (2003) Oncol Rep 10(6): 1875-1878. 8. Kuniyasu, H., Chihara, Y., Kubozoe, T., et al. 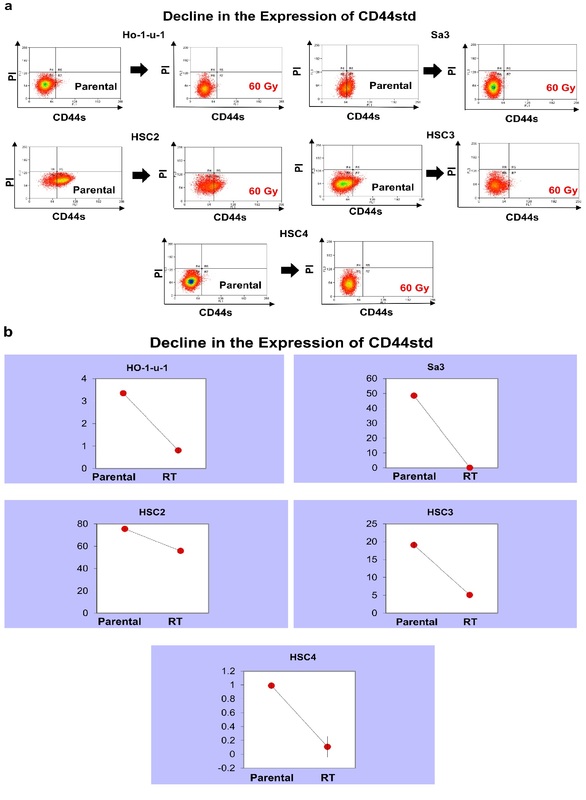 Co-expression of CD44v3 and heparanase is correlated with metastasis of human colon cancer. (2002) Int J Mol Med 10(3): 333-337. 9. Penno, M.B., August, J.T., Baylin, S.B., et al. Expression of CD44 in human lung tumors. (1994) Cancer Res 54(5): 1381-1387. 10. Ariza, A., Mate, J.L., Isamat, M., et al. Standard and variant CD44 isoforms are commonly expressed in lung cancer of the non-small cell type but not of the small cell type. (1995) J Pathol 177(4): 363-368. 11. Givehchian, M., Woerner, S.M., Lacroix, J., et al. Expression of CD44 splice variants in normal respiratory epithelium and bronchial carcinomas: no evidence for altered CD44 splicing in metastasis. (1996) Oncogene 12(5): 1137-1144. 12. Yamaguchi, A., Saito, M., Goi, T., et al. Expression of CD44 variant exons 8-10 in gastric cancer. (1995) Jpn J Cancer Res 86(12):1166-1171. 13. Joo, M., Lee, H.K., Kang, Y.K. Expression of E-cadherin, beta-catenin, CD44s and CD44v6 in gastric adenocarcinoma: relationship with lymph node metastasis. (2002) Anticancer Res 23(2B): 1581-1588. 14. Prffko, J., Bànkfalvi, A., Klauke, K., et al. Unaltered strong immunohistochemical expression of CD44-v6 and v5 isoforms during development and progression of oral squamous cell carcinomas. (1996) J Oral Pathol Med 25(9): 502-506. 15. Guo, Y.J., Liu, G., Wang, X., et al. Potential use of soluble CD44 in serum as indicator of tumor burden and metastasis in patients with gastric or colon cancer. (1994) Cancer Res 54(2): 422-426. 16. Iida, A., Bourguignon, L.Y. New CD44 splice variants associated with human breast cancers. (1995) J Cell Physiol 162(1): 127-133. 17. Heider, K.H., Hofmann, M., Horst, E., et al. A human homologue of the rat metastasis-associated variant of CD44 is expressed in colorectal carcinomas and adenomatous polyps. (1993) J Cell Biol 120(1): 227-233. 18. Matsumura, Y., Tarin, D. Significant of CD44 gene products for cancer diagnosis and disease evaluation. (1992) Lancet 340(8827): 1053-1058. 19. 19. Mackay, C.R., Terpe, H.J., Stauder, R., et al. Expression and modulation of CD44 variant isoforms in human. (1994) J Cell Biol 124(1): 71-82. 20. Reategui, E.P., Mayolo, A.A., Das, P.M., et al. Characterization of CD44v3-containing isoforms in head and neck cancer. (2006) Cancer Biol Ther 5(9): 11663-11668. 21. Rajarajan, A., Stokes, A., Bloor, B.K., et al. CD44 expression in oro-pharyngeal carcinoma tissues and cell line. (2012) Plos One 7(1): e28776. 22. Prince, M.E., Sivanandan, R., Kaczorowski, A., et al. Identification of a subpopulation of cells with cancer stem cell properties in head and neck squamous cell carcinoma. (2007) Proc Natl Acad Sci USA 104(3): 973-978. 23. Günthert, U., Hofmann, M., Rudy, W., et al. A new variant of glycoprotein CD44 confers metastatic potential to rat carcinoma cells. (1991) Cell 65(1): 13-24. 24. Tanabe, K.K., Ellis, L.M., Saya, H. Expression of CD44R1 adhesion molecule in colon carcinomas and metastases. (1993) Lancet 341(8847): 725-726. 25. Tsukita, S., Oishi, K., Sato, N., et al. ERM family members as molecular links between the cell surface glycoprotein CD44 and actin-based cytoskeletons. (1994) J Cell Biol 126(2): 391-401. 26. Sneath, R.J., Mangham, D.C. The normal structure and function of CD44 and its role in neoplasm. (1998) Mol Pathol 51(4): 191-200. 27. Carinci, F., Stabellini, G., Calvitti, M., et al. CD44 as prognostic factor in oral and oropharyngeal squamous cell carcinoma. (2002) J Craniofac Surg 13(1): 85-89. 28. Sato, S., Miyauchi, M., Takekoshi, T., et al. Reduced expression of CD44 variant 9 is related to lymph node metastasis and poor survival in squamous cell carcinoma of tongue. (2000) Oral Oncol 36(6): 545-549. 29. Mack, B., Gires, O. CD44s and CD44v6 expression in head and neck epithelia. (2008) PLoS One. 3(10): e3360. 30. Wielenga, V.J., Heider, K.H., Johan, G., et al. Expression of CD44 variant proteins in human colorectal cancer in human colorectal cancer is related to tumor progression. (1993) Cancer Res 53(20): 4754-4756. 31. Kunishi, M., Kayada, Y., Tsumura, M., et al. Expression of CD44 variant 6 and its metastatic potential in squamous cell carcinoma of oral cavity. (1996) Gan To Kagaku Ryoho 23(8): 1045-1048. 32. Herold-Mende, C., Steiter, S., Born, A.I., et al. Expression of CD44 splice variant in squamous epithelia and squamous cell carcinomas of head and neck. (1996) J Pathol 179(1): 66-73. 33. Seelentag, W.K.F., Guntert, U., Saremaslani, P., et al. CD44 standard and variant isoform expression in human epidermal skin tumors is not correlated with tumor aggressiveness but down-regulated during proliferation and tumor de-differentiation. (1996) Int J Cancer 69(3): 218-224. 34. Tsuruoka, S., Matsuo, K., Ishikawa, A., et al. Prognostic significance of CD44v3 and CD44v6 in oral squamous cell carcinoma of the tongue. (2011) Oral Med Pathol 15(4): 107-112. 35. Aso, T., Matsuo, M., Kiyohara, H., et al. Induction of CD44 variant 9-expressing cancer stem cells might attenuate the efficacy of chemo radio selection and worsens the prognosis of patients with advanced head and neck cancer. (2015) PLoS One 10(3): e0116596. 36. Ishimoto, T., Nagano, O., Yae, T., et al. CD44 variant regulates redox status in cancer cells by stabilizing the xCT subunit of system xc(-) and thereby promotes tumor growth. (2011) Cancer Cell 19(3): 387-400. 37. Takayama, T., Kubo, T., Morikawa, A., et al. Potential of sulfasalazine as a therapeutic sensitizer for CD44 splice variant 9-positive urogenital cancer. (2016) Med Oncol 33(5): 45. 38. de la Ballina, L.R., Cano-Crespo, S., González-Muñoz, E., et al. Amino acid transport associated to cluster of differentiation 98 heavy chain (CD98hc) is at the cross-road of oxidative stress and amino acid availability. (2016) J Biol Chem 291(18): 9700-9711. 39. Kawasaki, Y., Omori, Y., Li, Q., et al. 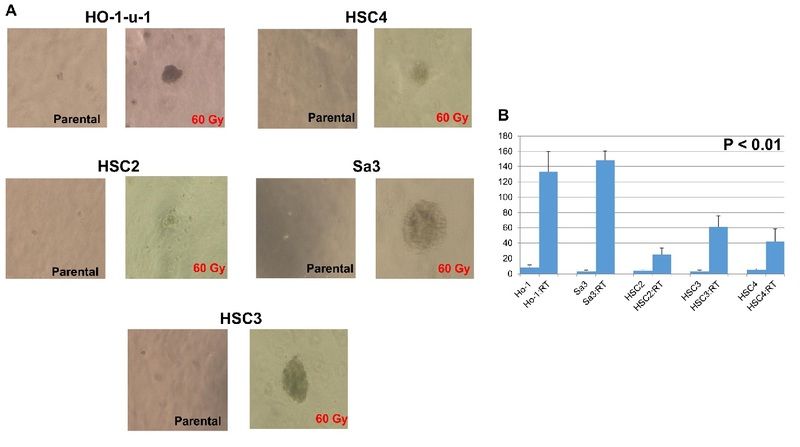 Cytoplasmic accumulation of connexin32 expands cancer stem cell population in human HuH7 hepatoma cells by enhancing its self-renewal. (2011) Int J Cancer 128(1): 51-62.